Successfully Added ATSC Digital TV Set Top Box to your Shopping Cart. Hey North America and other ATSC digital TV regions - now you can watch digital broadcasting channels on your Analog TV! This ATSC digital converter box receives and converts digital broadcast channels into analog signals straight to your television. As of June 2009, the US has gone digital, and if you're worried about the heavy costs of upgrading your media center in order to enjoy TV as you've always had, then worry no more! Help is at hand. 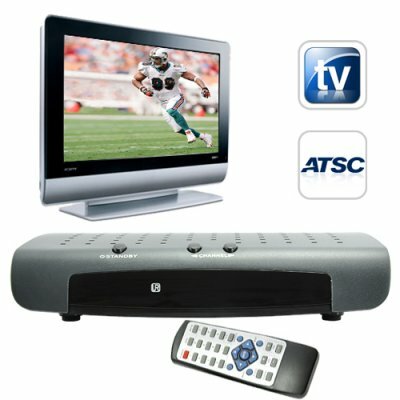 This ATSC Digital TV Set Top Box is the most effective way to continue watching TV without having to go out and purchase a $1000 TV or a $200 set top box. The E61 digital to analog converter box comes at a very attractive wholesale price, thereby allowing you to watch TV in your bedroom, study, kitchen, garage, or wherever else in the house you want to watch your favorite TV programs. The ATSC Digital TV Set Top Box is a small and easy to use digital converter box that takes the digital signal sent out by TV stations and networks and converts it to analog so you can watch TV programs on your analog TV. The E61 is an easy-to-use digital set top box, you don't need to be a techie to use this product. It is provided with an easy step-by-step installation instructions that you can follow to have it up and running in just a few short minutes. From power up, you'll instantly be able to scan for broadcast channels and start watching them within a few minutes, the E61 doesn't waste any time, it gets straight to work. This ATSC digital to analog converter set up box, also displays a signal meter which shows the signal quality and signal strength, and stays up for as long as you need it. The (UI) user interface is designed for simple navigation and usability, and also comes with (EPG) electronic program guide. If the picture appears off-center, or parts of it are cut off by your TV, there's a service menu where you can adjust vertical and horizontal position as well as horizontal and vertical size, which is pretty cool. If you're looking for a solid no-frills wholesale price digital converter box, then this is the one for you. The ATSC Digital TV Set Top Box is the perfect item for resellers and dropshippers to take advantage of the digital switchover that is taking place right now. With this products low factory direct wholesale price, you can provide a great service to people wanting to upgrade their old second TV's, while at the same time making some money for yourself. A great win-win for everyone! Easy to use, comes with a straight forward setup user menu, with parental control, EPG etc. Also called an "Analog to Digital Converter"
Why do I need to convert digital channels to analog in order to view them on my TV? Well, since the whole of the US has turned digital, if your current TV does not have a built-in digital ATSC receiver, then you will need this digital receiver to continue enjoying your TV viewing. What is the 4-pin connection used for? The 4-pin is used by the manufacturer to perform updates to the internal firmware.